I really enjoy making these halibut recipes; you will too after the first bite. 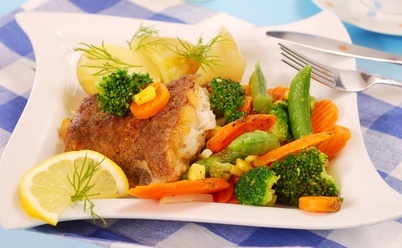 I prepare fresh halibut fish so it remains moist and flavorful and also offer great salsa, toppings and seasonings that will perk up those taste buds. 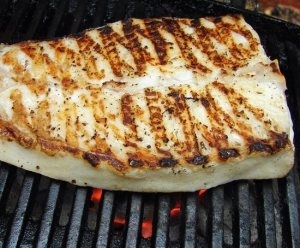 A delicious grilled halibut recipe that will impress family and friends. Mix the first 8 ingredients together to form a paste and spread on the fish with the back of a spoon or a butter knife. Place in a large resealable bag (or plastic wrap) and place in the refrigerator for 1-1/2 to 2 hours to marinate. Clean grill well with a brush and oil grates. Preheat to medium high. Place fillets on grill and cook for 3 to 5 minutes per side. Gently lift and turn over; grilling another 3 to 5 minutes. Cooking time may vary depending on how thick the fillets are. 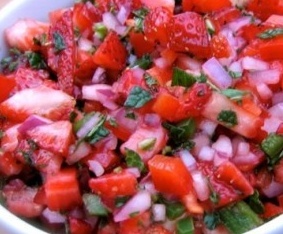 Remove fillets and serve with strawberry fruit salsa, lemon wedges. Serve with grilled asparagus and wild rice pilaf. You may also cook the fillets in pan, but it won't have the delightful flavor from the grill. A perfect compliment to the grilled halibut recipe. You may add any fruit desired, but the great taste of strawberry and jalapenos are fresh and fabulous; a combo I love. NOTE: Just be certain to make it just 1 hour before serving because this gorgeous salsa will begin to turn to mush and not look so pretty. **You may also oil up a few slices of fresh pineapple (olive oil). Just grill until you see the marks and turn over; it caramelizes and is delicious. You could even add it to the salsa. Speaking of strawberries, it reminds me of a savory blueberry sauce that I had in a restaurant that was delicious. I came home and had to try to duplicate it and I think it comes close. It reminds me of making homemade mayonnaise (pouring the olive oil through the top of a blender (food processor). Just combine the berries, lemon juice and vinegar and sugar. Process until smooth. With the blender or food processor running, slowly pour a thin stream of olive oil through the top until the mixture starts to thicken. If it is too thick you can add a tablespoon of water. Add the sugar to taste, and season with sea salt and freshly ground black pepper. Dollop over the top of spicy grilled fish fillets. Delicious. 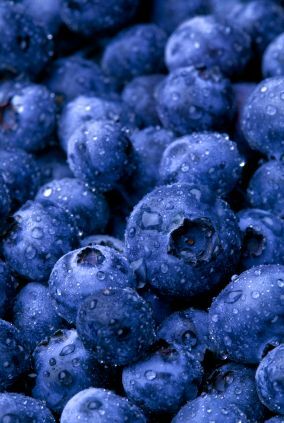 Note: Keep a few whole blueberries to use as a garnish over the fish topped with the blueberry sauce. PREHEAT oven to 375 degrees and line a baking sheet with parchment paper or foil (easy clean up!). Spray foil with oil. Drizzle fillets with olive oil and juice from 1 lemon. Season with salt, pepper and cayenne pepper, if using. Bake 15 to 20 minutes or until the fish flakes when tested with a fork. Mix well in a small bowl and keep in the refrigerator until the fish is ready to be served. Then dollop on top of each fillet. If you do this with a small cookie scoop, the presentation is beautiful. Serve with mashed potatoes (or even better) loaded mashed potatoes. Frozen sweet peas would be great addition too. What's for dessert? I've got one that is wonderful and refreshing on a hot evening. 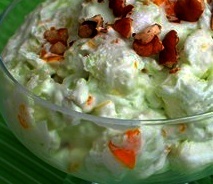 Try my fruit pistachio salad. Delicious. Dessert? 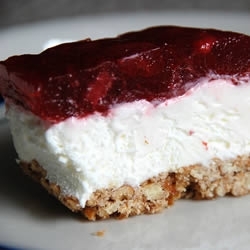 How about strawberry pretzel dessert? It's delicious and a wonderful way to have dessert and not feel so guilty because the fish meal was healthier. Enjoy. What's your favorite halibut recipe? Share with us below!